Scuba diving tanks allow divers to remain underwater for extended periods. The technology scuba tanks use is fairly straightforward, but it is critical that they function well and remain in good order. 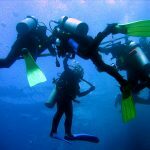 A malfunction, especially at significant diving depths, can have life and death consequences. Let’s a take a slightly more in depth look at scuba tank air compressor technology. Scuba diving tanks are aluminum cylinders filled with a mixture of oxygen and nitrogen. The ratio is usually 78% nitrogen to 22% oxygen. An oxygen enriched mixture called Nitrox is also sometimes used in diving tanks and consists of around 65% nitrogen to 35% oxygen. These tanks must be able to withstand high pressure: typically the nitrogen-oxygen mixture in a tank is at around 3000 pounds per square inch which equates to 204 atmospheres. Volume wise, a typical tank contains around 80 cubic feet of gas (this figure equates to 2,265 Liters). The nitrogen and oxygen mixture in a tank being under such pressure, it cannot be breathed directly. It would shoot out of the tank at high volume and explode a diver’s lungs (unless he was quick enough to stop breathing it in time). To deal with this, the pressure has to be “stepped down” before the diver breathes it. This is the purpose of the regulator. The first stage attaches directly to the diving tank and brings about an initial reduction in pressure. It brings the mixture from the 3000 psi (204 ATM) level down to what is called an intermediate pressure level, which is 140 psi or 9.5 ATM. The above pressure is still too highly pressurized to breathe directly, so the mixture enters a hose that connects to a second stage. There are two chambers within the first stage, one which receives the high pressure gas, and the other, called the intermediate pressure chamber, which steps it down as well as monitoring the ambient water pressure by means of a piston and diaphragm system. The second stage reduces the pressure from the intermediate level to the water pressure level. The latter varies with depth, increasing the deeper a diver descends. It may range, for instance, from 1 ATM to 5 ATM depending on how far underwater a diver ventures. When a diver inhales, the air mixtures exits through the hose and enters the second stage, which is essentially the mouthpiece through which the diver breathes. When this occurs, the pressure in the intermediate stage is also temporarily reduced to below the pressure level of the underwater environment. This causes the water to push in on a diaphragm, which in turn opens a piston, letting more of the air mixture in from the high pressure chamber. When enough air mixture comes in from the high pressure chamber to make the intermediate pressure equal with the ambient water pressure, the piston closes again. This process repeats each time the diver inhales through the second stage mouthpiece. So In effect you have a sequence of chambers that respond to changes in pressure caused by inhalation and exhalation: the first stage high pressure chamber, the first stage intermediate pressure chamber, and the second stage mouthpiece chamber, which is where the pressure changes originate as the diver breathes. When the diver exhales into the second stage, air and carbon dioxide enters the second stage/mouthpiece and increases the pressure, causing the diaphragm to expand. This allows the inlet valve (which leads to the intermediate chamber of the first stage) to close and opens an exhaust valve, out of which the exhaled air exits. The first stage has a few other ports that connect via hoses to other devices, such as a spare second stage (in case the original malfunctions) and a pressure gauge. Included also are spare short term breathing tanks designed to supply a diver with enough air to return to the surface in the event of a complete failure of the tank. The only other relevant piece of equipment is the snorkel, which is used for breathing during surface swimming in order to conserve tank air. That is the basic function of a diving tank in a nutshell. The second stage needs to be cleaned (with fresh water rather than salt) after use to eliminate salt, mud and other impurities that can clog up the apparatus. The entire assemblage needs to be properly maintained to ensure maximum diving safety and the effectiveness of the equipment. A good functioning diving tank safeguards a safe and enjoyable diving experience.